Jacques Laurent Cosson, maître in 1765. 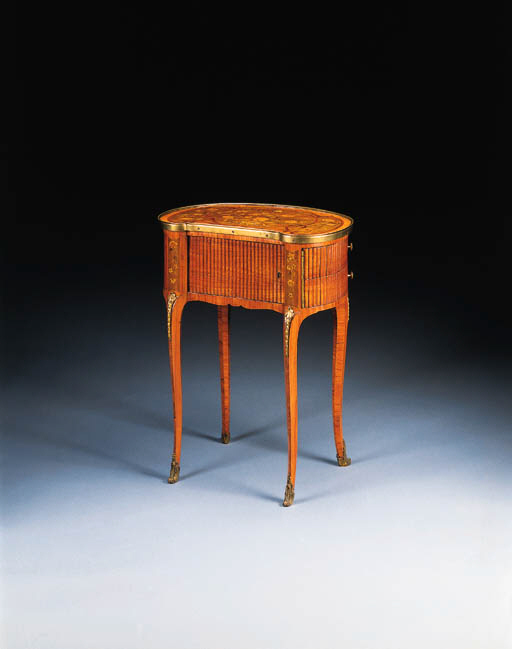 The brand on this table indicates that it formed part of the collection of Louis-Jean-Marie de Bourbon, duc de Penthièvre (1725-1793) at the château de Chanteloup. The son of the Comte de Toulouse, (the illegitimate son of Louis XIV and Madame de Montespan) his son married the princesse de Lamballe while his daughter married the duc d'Orléans. In 1737 on the death of his father he succeeded to the post of Admiral de France which accounts for the presence of an anchor in his inventory brands. The duc de Penthièvre acquired the château de Chanteloup late in his life in 1785 from the estate of the duc de Choiseul having been prevailed upon to sell his birthplace the château de Rambouillet to Louis XVI in 1783 (see G. De Bellaigue, The James A. de Rothschild Collection at Waddesdon Manor, Furniture and Gilt Bronzes, 1974, p. 600).